Remote SQL backups are complicated. We will explain why and show all the available options to make the backups anyway. Remote SQL Server is a server where you have limited access to the server’s file system like in a shared hosting environment. Local SQL Server is a server where you have full access to the file system like a local server you can physically access or a dedicated/virtual server that you have full control of. What is the problem with Remote SQL Server backups? The main issue with remote SQL servers is that you can run SQL scripts, including BACKUP DATABASE command, but accessing the resulting *.bak file is problematic. The *.bak file is placed somewhere on the drive local to that SQL server. And if you don’t access to that location, you can not copy the backup file for further processing like compression, encryption, storage, etc. (more details on what SQL backup automation means) Then your options are limited to creating a script file. 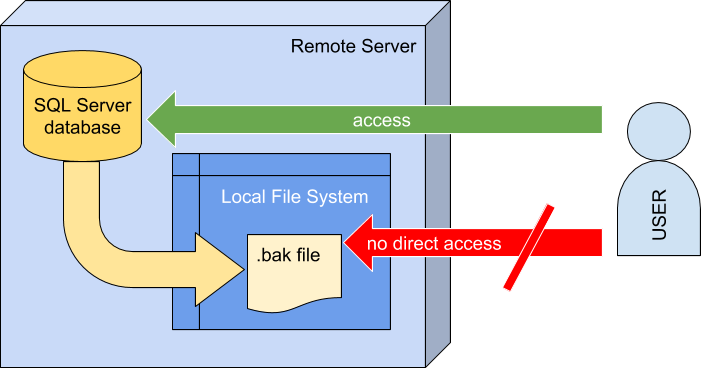 BAK files are the backups created using Microsoft’s standard BACKUP DATABASE command (or through SSMS or SQLBackupAndFTP). They usually get *.bak extension. If you have an option to create *.bak files – always prefer it to the alternatives because it allows you to store not only Full, but Differential and Transaction Log backups as well. And the format is the most common and not proprietary to any 3rd party. You can restore from (*.bak) file using standard RESTORE DATABASE command and many 3rd party tools. Script (*.sql) file is basically a set of SQL commands that re-create the database objects and insert the data into the tables. The benefit of using a script file is that most hosting environments let you upload script files and run them by using a hosting administration control panel. Then you can restore a database without requiring anything to be installed or configured by the hoster. Such script takes more space since it is a textual (not binary) representation of your database, though it is much more compressible than a binary backup. Local SQL Server backup is well documented and we won’t get into the details of it here. Basically, you run BACKUP DATABASE command, use SQL Server Management Studio or 3rd party tools. This creates a *.bak file on Server’s local file system. Then you usually compress the file, encrypt it, upload to a network drive, FTP or a cloud, etc. You can build your custom scripts to do it or get it all in a product like SQLBackupAndFTP. And from your your own computer you would be able access the same location, take the *.bak file and do what you want with it. 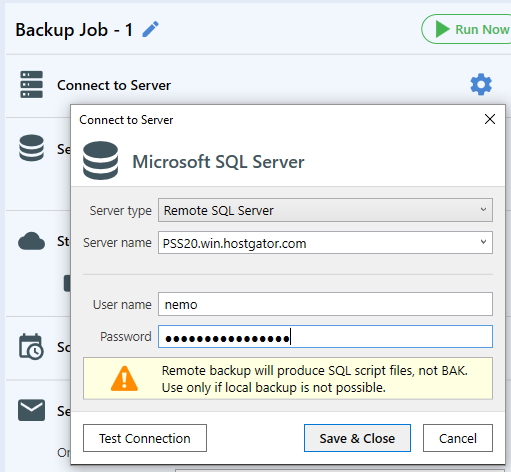 You can write your own scripts to automate it or backup your network SQL Server using SQLBackupAndFTP. The benefit of backups to UNC path is that you get the backup in the same coveted *.bak format. The downside is basically related to the need to configure access rights correctly. Visit the link above for details on permissions. Copy the script to your local file and store or run wherever needed. Choose “SQL Server Native Client” as a data source and your remote SQL server as a server name. Select the database to copy the data from. Next. Choose “SQL Server Native Client” as a data source and your local SQL server as a server name. Select the database to copy the data to. Next. If you can, take local backups as *.bak files. Otherwise to automate remote SQL backups, use SQLBackupAndFTP. Your article is really great. Very useful content. Thank you.